Hope all of you enjoyed Benchmark FTW last week. We were honored to have those great guest bloggers contribute to our little space. The Weekly Wrap kicks off with all of those posts in one easy-to-find spot and continues with more of what we do best. Great, entertaining and education business and marketing content. You know...if I say so myself and whatnot. A whole bunch of talented writers and myself weighed in on our favorite tech last week. 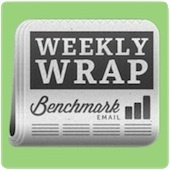 Find the gadgets and gizmos to boost your business here with Benchmark Email’s Favorite Tech Week Blogs. As a journalism school grad, I’m just happy someone thinks there is a future at all in journalism. Read about how The Times Abandons Local, & the Future of Hyperlocal Journalism. If you just thought to yourself, “HuffPo launched a digital magazine?” make that the 6, not 5 Lessons You Can Learn from HuffPo’s New Digital Magazine Launch. Hint...lose the fanny pack. All you need to know about Designing Email Templates: How to Inspire a Younger Audience. You guys...never tell Hal a secret. Apparently he’s terrible at keeping them. I present to you exhibit A, The Secrets to Building an Online Community: Reddit-Style. One of the best articulated arguments I’ve seen in the great debate on The Hunt for the Best Business Phone: iPhone or Android? Benchmark Email’s Daniel Miller & Jose Hernandez on W Radio! Daniel and Jose’s recent TV appearances preclude me from making face for radio jokes, so I”ll just tell you to check out Benchmark Email’s Daniel Miller & Jose Hernandez on W Radio! I haven’t checked out FeedStream yet, so I’m just going to assume it does the same thing as picturing his “happy place” did for Happy Gilmore. See how you can Visualize Your News with FeedStream. Lots of what-ifs here. The world will never know what could have been. Check out the Benchmark 5: Top Almost-Rans of the Benchmark 5. The latest thing for you to be up in arms about with, but not at all change how much time you spend on Facebook. See how Facebook Users Slammed with an Email Account No One Wants.